Many applications that process multimedia assets make use of some form of metadata that describe the multimedia content. The goals of this document are to explain the advantages of using Semantic Web languages and technologies for the creation, storage, manipulation, interchange and processing of image metadata. In addition, it provides guidelines for Semantic Web-based image annotation, illustrated by use cases. Relevant RDF and OWL vocabularies are discussed, along with a short overview of publicly available tools. This document was developed by the W3C Multimedia Semantics Incubator Group. A previous version of this document has been produced by the Multimedia Annotation on the Semantic Web Task Force of the W3C Semantic Web Best Practices & Deployment Working Group, which is part of the W3C Semantic Web activity. After reading this document, readers may turn to separate living documents discussing individual multimedia annotation vocabularies, and other relevant tools and resources. Most of the current approaches to image annotation are not based on Semantic Web languages. Interoperability between these technologies and RDF and OWL-based approaches is not the topic of this document, but interested readers can look at the Multimedia Annotation Interoperability Framework document. This document is target at everybody with an interest in image annotation, ranging from non-professional end-users that are annotating their personal digital photos to professionals working with digital pictures in image and video banks, audiovisual archives, museums, libraries, media production and broadcast industry, etc. To illustrate the benefits of using semantic technologies in image annotations. To provide guidelines for applying semantic technologies in this area. To collect currently used vocabularies for Semantic Web-based image annotation. To provide use cases with examples of Semantic Web-based image annotation. Discussion of this document is invited on the public mailing list public-xg-mmsem@w3.org (public archives). Public comments should include "[MMSEM-Image]" as subject-prefix. The need for annotating digital image data is recognized in a wide variety of different applications, covering both professional and personal usage of image data. At the time of writing, most work done in this area does not yet use semantic-based technologies. This document explains the advantages of using Semantic Web languages and technologies for image annotation and provides guidelines for doing so. It is organized around a number of representative use cases, and a description of Semantic Web vocabularies and tools that could be used to help accomplish the task mentioned in the uses cases. The use cases are intended as a representative set of examples, providing both personal and industrial, and open and closed domain examples. They will be used later to discuss the vocabularies and tools that are relevant for image annotation on the Semantic Web. Example scenarios are given in Section 5. The use cases differ in the topics depicted by the images or their usage community. These criteria often determine the tools and vocabularies used in the annotation process. Many personal users have thousands of digital photos from vacations, parties, traveling, friends and family, everyday life, etc. Typically, the photos are stored on personal computer hard drives in a simple directory structure without any metadata. The user wants generally to easily access this content, view it, use it in his homepage, create presentations, make part of it accessible for other people or even sell part of it to image banks. Too often, however, the only way for this content to be accessed is by browsing the directories, their name providing usually the date and the description with one or two words of the original event captured by the specific photos. Obviously, this access becomes more and more difficult as the number of photos increases and the content becomes quickly unused in practice. More sophisticated users leverage simple photo organizing tools allowing them to provide keyword metadata, possibly along with a simple taxonomy of categories. This is a first step towards a semantically-enabled solution. Section 5.1 provides an example scenario for this use case using Semantic Web technologies. Let us imagine that a museum in fine arts has asked a specialized company to produce high resolution digital scans of the most important art works of their collections. The museum's quality assurance requires the possibility to track when, where and by whom every scan was made, with what equipment, etc. The museum's internal IT department, maintaining the underlying image database, needs the size, resolution and format of every resulting image. It also needs to know the repository ID of the original work of art. The company developing the museum's website additionally requires copyright information (that varies for every scan, depending on the age of the original work of art and the collection it originates from). It also want to give the users of the website access to the collection, not only based on the titles of the paintings and names of their painters, but also based on the topics depicted ('sun sets'), genre ('self portraits'), style ('post-impressionism'), period ('fin de siècle'), region ('west European'). Section 5.2 shows how all these requirements can be fulfilled using Semantic Web technologies. Audiovisual archive centers are used to manage very large multimedia databases. For instance, INA, the French Audiovisual National Institute, has been archiving TV documents since the fifties, radio documents since the forties, and stores more than 1 million hours of broadcast programs. They have recently put online and in free access more than 10000 hours of French TV programs. The images and sound archives kept at INA are primarily intended for professional use (journalists, film directors, producers, audiovisual and multimedia programmers and publishers, in France and worldwide) or communicated for research purposes (for a public of students, research workers, teachers and writers), but they are, now, more and more available for the general public. In order to allow an efficient access to the data stored, most of the parts of these video documents are described and indexed by their content. The global multimedia information system should then be fine-grain detailed enough to support some very complex and precise queries. For example, a journalist or a film director might ask for an excerpt of a previously broadcasted program showing the first goal of a given football player in its national team, scored with its head. The query could additionally contain some more technical requirements such that the goal shot should be available according to both the front camera view and the reverse angle camera view. Finally, the client might or might not remember some general information about this football game, such that the date, the place and the final score. Section 5.3 gives a possible solution for this use case using Semantic Web technologies. Many organizations maintain extremely large-scale image collections. The National Aeronautics and Space Administration (NASA), for example, has hundreds of thousands of images, stored in different formats, levels of availability and resolution, and with associated descriptive information at various levels of detail and formality. Such an organization also generates thousands of images on an ongoing basis that are collected and cataloged. Thus, a mechanism is needed to catalog all the different types of image content across various domains. Information about both the image itself (e.g., its creation date, dpi, source) and about the specific content of the image is required. Additionally, the associated metadata must be maintainable and extensible so that associated relationships between images and data can evolve cumulatively. Lastly, management functionality should provide mechanisms flexible enough to enforce restriction based on content type, ownership, authorization, etc. Section 5.4 gives an example solution for this use case. A health-care provider might be interested in annotating medical images for clinical applications, education or other purposes. Diagnostic images involved in patient care need to be properly annotated from different points of view: the image modality (radiograph, MRI, etc) and its acquisition parameters (including time), the patient and anatomical body part depicted by the image, the associated report data such as diagnosis reports and electronic patient records. When such images are used for medical education, anonymization is needed in order to not reveal personal data to unauthorized users. Educational images need a clear description of modality, anatomical parts, and morphological and diagnostic comments. Such metadata may refer to the complete image or, often, to just one or more subregions, which need to be identified in some way. Educational metadata could be directly shown to users or maintained hidden to develop self-learning skills. Section 5.5 gives an example solution addressing these requirements. Before discussing example solutions to the use cases, this section provides a short overview of image annotation in general, focussing on the issues that often make image annotation much more complex than initially expected. In addition, it briefly discusses the basic Semantic Web concepts that are required to understand the solutions provided later. A general rule is that it is much easier to annotate earlier rather than later. Typically, most of the information that is needed for making the annotations is available during production time. Examples include time and date, lens settings and other EXIF metadata added to JPEG images by most digital cameras at the time a picture is taken, experimental data in scientific and medical images, information from scripts, story boards and edit decision lists in creative industry, etc. Indeed, maybe the single most "best" practice in image annotation is that in general, adding metadata during the production process is much cheaper and yields higher quality annotations than adding metadata in a later stage (such as by automatic analysis of the digital artifact or by manual post-production data). Annotating images without having a specific context, goal or task in mind is often not cost effective: after the target application has been developed, it may turn out that images have been annotated with information that insufficiently covers the new requirements. Redoing the annotations is then an unavoidable, but costly solution. On the other hand, annotating with only the target application in mind may also not be cost effective. The annotations may work well with that one application, but if the same metadata is to be reused in the context of other applications, it may turn out to be too specific, and unsuited for reuse in a different context. In most situations the range of applications in which the metadata will be used in the future is unknown at the time of annotation. When lacking a crystal ball, the best the annotator can do in practice is use an approach that is sufficiently specific for the application under development, while avoiding unnecessary application-specific assumptions as much as possible. Manual versus automatic annotation and the "Semantic Gap"
In general, manual annotation can provide image descriptions at the right level of abstraction. It is, however, time consuming and thus expensive. In addition, it proves to be highly subjective: different human annotators tend to "see" different things in the same image. On the other hand, annotation based on automatic feature extraction is relatively fast and cheap, and can be more systematic. It tends to result, however, in image descriptions that are too low level for many applications. The difference between the low level feature descriptions provided by image analysis tools and the high level content descriptions required by the applications is often referred to, in the literature, as the Semantic Gap. In the remainder, we will discuss use cases solutions, vocabularies and tools for both manual and automatic image annotation. While various classifications of metadata have been described in the literature, every annotator should at least be aware of the difference between annotations describing properties of the image itself, and those describing the subject matter of the image, that is, the properties of the objects, persons or concepts depicted by the image. In the first category, typical annotations provide information about title, creator, resolution, image format, image size, copyright, year of publication, etc. Many applications use a common, predefined and relatively small vocabulary defining such properties. Examples include the Dublin Core and VRA Core vocabularies. The second category describes what is depicted by the image, which can vary widely with the type of image at hand. In many applications, it is also useful to distinguish between objective observations ('the person in the white shirt moves his arm from left to right') versus subjective interpretations ('the person seems to perform a martial arts exercise'). As a result, one sees a large variation in vocabularies used for this purpose. Typical examples vary from domain-specific vocabularies (for example, with terms that are very specific for astronomy images or sport images) to domain-independent ones (for example, a vocabulary with terms sufficiently generic to describe any news photo). In addition, vocabularies tend to differ in size, granularity, formality etc. In the remainder, we discuss the above metadata categories. Note that in the first type it is not uncommon that a vocabulary only defines the properties and defers the definitions of the values of those properties to another vocabulary. This is true, for example, for both Dublin Core and VRA Core. This means that, typically, in order to annotate a single image one needs terms from multiple vocabularies. Many different file formats and tools for image annotations are currently in use. Reusing metadata created by another tool is often hindered by a lack of interoperability. First, a tool may use a different syntax for its file formats. As a consequence, other tools are not able to read in the annotations produced by this tool. Second, a particular tool may assign a different meaning (semantics) to the same annotation. In this situation, the tool may be able to read annotations from other tools, but will fail to process them in the way originally intended. Both problems can be solved by using Semantic Web technology. First, the Semantic Web provides developers with means to explicitly specify the syntax and semantics of their metadata. Second, it allows tool developers to make explicit how their terminology relates to that of other tools. The document will provide examples of both cases. This section briefly describes the role of Semantic Web technologies in image annotations. The aim of the Semantic Web is to augment the existing Web so that resources (Web pages, images etc.) are more easily interpreted by programs (or "intelligent agents"). The idea is to associate Web resources with semantic categories which describe the contents and/or functionalities of Web resources. Annotations alone do not establish the semantics of what is being marked-up. One way generally followed to introduce semantics to annotations is to get a community to agree on what a set of concepts mean, and what terms have to be used for them. The Elephant Ganesh, photo from a personal collection. Consider the following example of an image anntotated using the Dublin Core Metadata Element Set. The Dublin Core provides 15 "core" information properties, such as "Title", "Creator" or "Date". 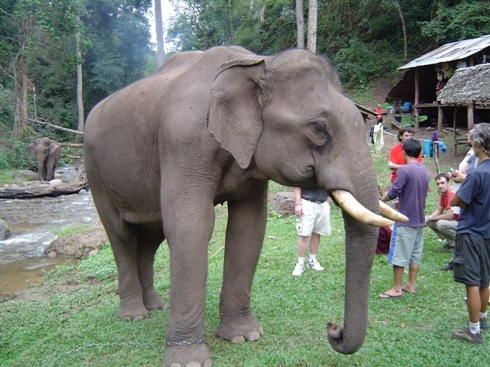 The following RDF/XML example code represents the statements: 'There is an image Ganesh.jpg created by Jeff Z. Pan whose title is An image of the Elephant Ganesh'. The first four lines define the XML namespaces used in this description. A good starting point for more information on RDF is the RDF Primer. The disadvantage of the example above is that the meaning of all the metadata values are strings, which cannot easily be interpreted by automated procedures. Applications that need to process the image based on this meaning, need to have this processing hardwired into their code. For example, it would be hard for an application to find out that this image could match queries such as "show me all images with animals" or "show me all images of Indian deities". An approach to solve this is to take the informal agreement about the meaning of the terms used in the domain as a starting point and to convert this into a formal, machine processable version. This version is than typically referred to as an ontology. It provides, for a specific domain, a shared and common vocabulary, including important concepts, their properties, mutual relations and constraints. This formal agreement can be communicated between people and heterogeneous, distributed application systems. The ontology-based approach might be more difficult to develop. It is, however, more powerful than the approach that is based only on informal agreement. For example, machines can use the formal meaning for reasoning about, completing and validating the annotations. In addition, human users can more thoroughly define and check the vocabulary using axioms expressed in a logic language. Ideally, the concepts and properties of an ontology should have both formal definitions and natural language descriptions to be unambiguously used by humans and software applications. Now, by refering to the formally defined concepts of "Indian Elephant" and "Ganesh" in WordNet, even applications that have never encountered these concepts before could request more information about the WordNet definitions of the concepts and find out, for example, that "Ganesh" is a hyponym of the concept "Indian Deity", and that "Indian Elephant" is a member of the "Elephas" genus of the "Elephantidae" family in the animal kingdom. Choosing which vocabularies to use for annotating image is a key decision in an annotation project. Typically, one needs more than a single vocabulary to cover the different relevant aspects of the images. A separate document named Multimedia Vocabularies on the Semantic Web discusses a number of individual vocabularies that are relevant for images annotation as well as their translations into RDF or OWL. The remainder of this section discusses more general issues. Many of the relevant vocabularies have been developed prior to the Semantic Web. Most notably, the key International Standard in this area, the Multimedia Content Description standard, widely known as MPEG-7, is defined using XML Schema. At the time of writing, there is no commonly accepted mapping from the XML Schema definitions in the standard to RDF or OWL. Several alternative mappings, however, have been developed so far and are discussed in the MPEG-7 and the Semantic Web document. Another relevant vocabulary is the VRA Core. Where the Dublin Core (DC) specifies a small and commonly used vocabulary for on-line resources in general, VRA Core defines a similar set targeted especially at visual resources, specializing the DC elements. Dublin Core and VRA Core both refer to terms in their vocabularies as elements, and both use qualifiers to refine elements in similar way. All the elements of VRA Core have either direct mappings to comparable fields in Dublin Core or are defined as specializations of one or more DC elements. Furthermore, both vocabularies are defined in a way that abstracts from implementation issues and underlying serialization languages. A key difference, however, is that for Dublin Core, there exists a commonly accepted mapping to RDF, along with the associated schema. At the time of writing, this is not the case for VRA Core, and the Multimedia Vocabularies on the Semantic Web document discusses briefly the pros and cons of the alternative mappings. Many annotations on the Semantic Web are about an entire resource. For example, a <dc:title> property applies to the entire document. For images and other multimedia documents, one often needs to annotate a specific part of a resource (for example, a region in an image). Sharing the metadata dealing with the localization of some specific part of multimedia content is important since it allows to have multiple annotations (potentially from multiple users) referring to the same content. In the ideal situation, the target image already specifies this specific part, using a (anchor) name that is addressable in the URI fragment identifier. This can be done, for example, in SVG. Otherwise, the region needs to be described in the metadata itself, as it is done in MPEG-7. The drawback of this strategy is that different annotations of a single region each need to redefine the region's border. The region definition could be defined once for all in an independant and identified file, but then, the annotation will be about this XML snippet definition and not about the image region content. The next section discusses general characteristics of the existing annotation tools for images. Among the numerous tools used for image archiving and description, some of them may be used for semantic annotation. The aim of this section is to identify some key characteristics of semantic image annotation tools, such as the type of content they can handle or if they allow fine-grained annotations, so as to provide some guidelines for their proper use. Using these characteristics as criteria, users of these tools could choose the most appropriate for a specific application. Type of Content. A tool can annotate different type of content. Usually, the raw content is an image, whose format can be jpg, png, tif, etc. but there are tools that can annotate videos as well. Type of Metadata. An annotation can be targeted for different use. Following the categorization provided by The Making of America II project, the metadata can be descriptive (for description and identification of information), structural (for navigation and presentation), or administrative (for management and processing). Most of the tools can be used in order to provide descriptive metadata and for some of them, the user can also provide structural and administrative information. Format of Metadata. An annotation can be expressed in different format. This format is important since it should ensure interoperability with other (semantic web) applications. MPEG-7 is often used as the metadata format for exchanging automatic analysis results whereas OWL and RDF are more appropriate in the Semantic Web world. Annotation level. Some tools give to the user the opportunity to annotate an image using vocabularies while others allow free text annotation only. When ontologies are used (in RDF, SKOS or OWL format), the annotation level is considered to be controlled since the semantics is generally provided in a more formal way, whereas if they are not, the annotation level is considered to be free. Client-side Requirement. This characteristic refers to whether users can use a Web browser to access the service(s) or need to install a stand-alone application. License Conditions. Some of the tools are open source while some others are not. It is important for the user and for potential researchers and developers in the area of multimedia annotation to know this issue before choosing a particular tool. Collaborative or individual. This characteristic refers to the possible usage of the tool as an annotation framework for web-shared image databases or as an individual user multimedia content annotation tool. Granularity. Granularity specifies whether annotation is segment based or file based. This is an important characteristic since in some applications, it could be crucial to provide the structure of the image. For example, it is useful to provide annotations for different regions of the image, describing several cues of information (like a textual part or sub-images) or defining and describing different objects visualized in the image (e.g. people). Threaded or unthreaded. This characteristic refers to the ability of the tool to respond or add to a previous annotation and to stagger/structure the presentation of annotations to reflect this. Access control. This refers to the access provided for different users to the metadata. For example, it is important to distinguish between users that have simple access (just view) and users that have full access (view or change). Concluding, the appropriateness of a tool depends on the nature of annotation that the user requires and cannot be predetermined. A separate wiki page is maintained with Multimedia Semantics Tools and Resources, and categorizes most of the annotation tools found in the web, according to the characteristics described above. Any comments, suggestions or new tools annoucements will be added to this separate document. The tools can be used for different types of annotations, depending on the use cases, as shown in the following section. This section describes possible scenarios for how Semantic Web technology could be used for supporting the use cases presented in Section 1. These scenarios are provided purely as illustrative examples and do not imply endorsement by the W3C membership or the Semantic Web Best Practices and Deployment Working Group or the W3C Multimedia Semantics Incubator Group. The proposed scenario for the use case of the management of Personal Digital Photo Collections, described in Section 1.1, assumes annotations of the photos using multiple vocabularies for describing their properties and their content. The properties of the image itself, e.g. the creator, the resolution, the date of capture, are described with terms from the DC and VRA vocabularies. For the description of the content of the images a variety of existing vocabularies are used and few domain specific ontologies are created, because the potential subject of a photo from a personal digital collection is very wide, and may include notions such as vacations, special events of the personal history, landscapes, locations, people, objects, etc. 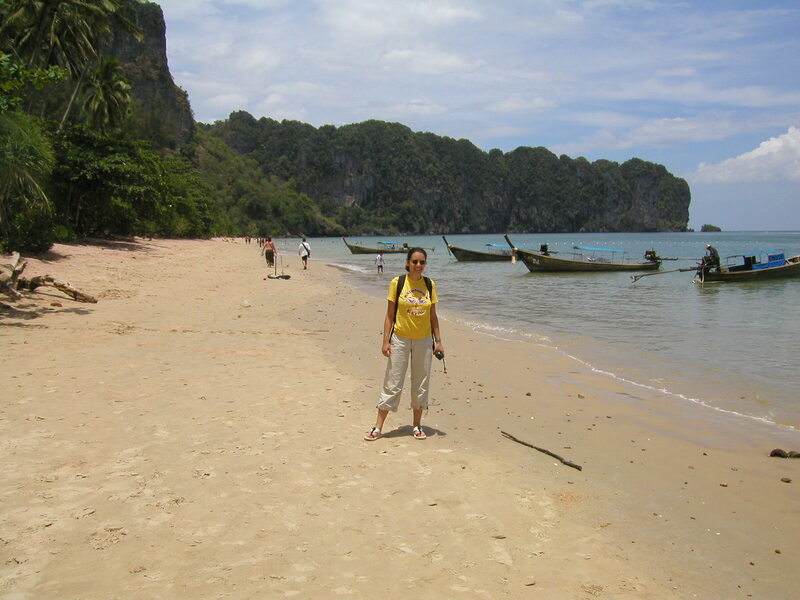 As a sample from a personal digital photo collection, a photo that depicts the vacations of a person named Katerina Tzouvara in Thailand is chosen. The FOAF vocabulary is then used to describe the person depicted in the image. Three domain specific ontologies: the "location", the "landscape" and the "event" ontologies are also used. The RDF format is chosen as the most appropriate for all the vocabularies, the ontologies and the annotation file. Any existing editor can be used for editing the ontologies and the annotation file (see the resulting RDF file). Firstly, a decision about the format of the annotation file has to be made. The RDF/XML syntax of RDF is chosen in order to gain interoperability. The RDF/XML syntax of RDF is well-formed XML with an overlay of constraints and is parsable with XML technology. And three domain-specific ontologies: event, location and landscape. The inner element that follows (rdf:Description), wraps the subject-predicate-object triples. The subject, declared by the rdf:about attribute is the image (identified by its URI) that will be annotated, the predicates are properties of the image and the objects are the values of these properties. The following block of triples provides general information about the entire photo. The Dublin Core terms are mainly used to provide this kind of information, since they are general enough and widely accepted by the metadata communities. The first predicate-object pair states that the object of the annotation file is an image, using the DC term-property type (dc:type) as the predicate, and the DCMI Type term-concept Image as the object. The DC term-property description (dc:description) in the next line provides a short linguistic human-understandable description of the subject of the image. The DC term-property creator (dc:creator) is then used for specifying the creator of the image. In order to define that the creator is a person (and e.g. not an organization or a company), the FOAF term-class Person (foaf:Person) is used. The name of the person is defined using the FOAF term-properties familyname (foaf:familyname) and firstname (foaf:firstname). The values of these properties are RDF Literal. Note that these two properties are preferred to the general foaf:name property since the absence of any further rules or standards for the construction of individual names could mislead the reasoning engines that would not be able to discriminate the first name from the family name. The DC property date (dc:date) completes the description describing the capture day of the photo. The RDF Literal value of this property is conformed to the ISO 8601 specifications for representing dates and times. Some more technical information about the format and the resolution of the photo are included in the annotation file using the DC property format (dc:format) and the term JPEG of the MIME vocabulary, and the VRA property measurements.resolution (vra:measurements.resolution). Though they may not seem really important for this specific use case, these properties should exist for the purpose of interchanging personal digital photos among users with different hardware and software capabilities. The rest of the annotation file focuses on the description of the content of the image. In order to provide a complete description of the content, it is often useful to try to answer the questions "when", "where" and "why" the photo has been taken, and "who" and "what" is depicted on the photo, because these are the most probable questions that the end-user would like to be queried during the retrieval process. Firstly, the location and the landscape depicted on the photo are described. To do so, two domain ontologies are built as simple as needed for the purposes of the annotation of this image: the location ontology, whose prefix is locat, and the landscape ontology, whose prefix is lsc. The location ontology provides concepts such as continent (locat:Continent), country (locat:Country), city (locat:City), and properties for the representation of the fact that an image is taken in a specific continent (locat:located_in_Continent), country (locat:located_in_Country) and city (locat:located_in_City). The landscape ontology classes represent concepts such as mountain (lsc:Mountain), beach (lsc:Beach), sand (lsc:Sand) and tree (lsc:Tree). The FOAF property depicts (foaf:depicts) stands for the relation that an image depicts something or someone. The FOAF property name (foaf:name) informs that any kind of location or landscape has a specific name. The TGN vocabulary is used for the names of the locations and landscapes, e.g. Thailand, and the AGROVOC thesaurus is used for the names related to agriculture, e.g. Phoenix Dactyliphera. For the representation of the relation that a city belongs to a specific country, the property locat:belongs_to_Country has been used. The advantages of using Semantic Web technologies in this use case can be already shown at this stage. Suppose that the annotation file did not include the lines that fully declare explicitly in which country the picture has been taken, but that it included only the lines that state that the photo was taken in the city Phi Phi which belongs to the country Thailand. When the end-user will query for retrieving photos depicting Thailand, the application for the management of the digital photo collection using reasoning techniques should return as a result all the photos that are explicitly declared to show Thailand, but also all the photos that are implicitly declared to portray Thailand, e.g. by being explicitly declared to be captured in a city that belongs to Thailand. To describe the events captured on the image, a simple ontology representing the important events for a person is created. This ontology conceptualizes occasions such as business traveling (event:Business_Traveling or event:Conference), vacations (event:Vacations), sports activities (event:Sports_Activity), celebrations (event:Celebration or event:Birthday_Party), etc. Finally, the foaf:depicts property and the foaf:Person concept are used for identifying the person shown on the image. It is obvious, from this analysis of the annotation process, that there are many important issues under discussion in order to improve the efficiency of Semantic Web technologies. Firstly, the various vocabularies, such as FOAF, VRA, TGN, do not have yet a standardized representation in a standardized ontology language, such as OWL or RDF. Secondly, there do not exist many domain specific vocabularies about the description of the content of visual document, e.g. there are not any landscape, personal history event vocabularies, nor vocabularies about the possible objects depicted by an image. This deficiency of annotation standards causes interoperability problems between the different types of annotated content during the management and retrieval process. Finally, another important concern is to which depth the annotation process should proceed. In the example above, one might find it is important to annotate also the clothes of the person, but someone else may believe that it is more important to annotate the objects on the beach, etc. This is a matter of the annotation approach which should be defined according to the end-user needs. In conclusion, there is still much work to be done for improving the use of Semantic Web technologies for describing multimedia material. However, as shown in this use case analysis, deploying ontology-based annotations on personal computers applications will enable a much more focused and integrated content management and ease the exchange of personal photos. Claude Monet, Garden at Sainte-Adresse. Image courtesy of Mark Harden, used with permission. Many of the requirements of the use case described in Section 1.2 can be met by using the vocabulary developed by the VRA in combination with domain-specific vocabularies such as Getty's AAT and ULAN. 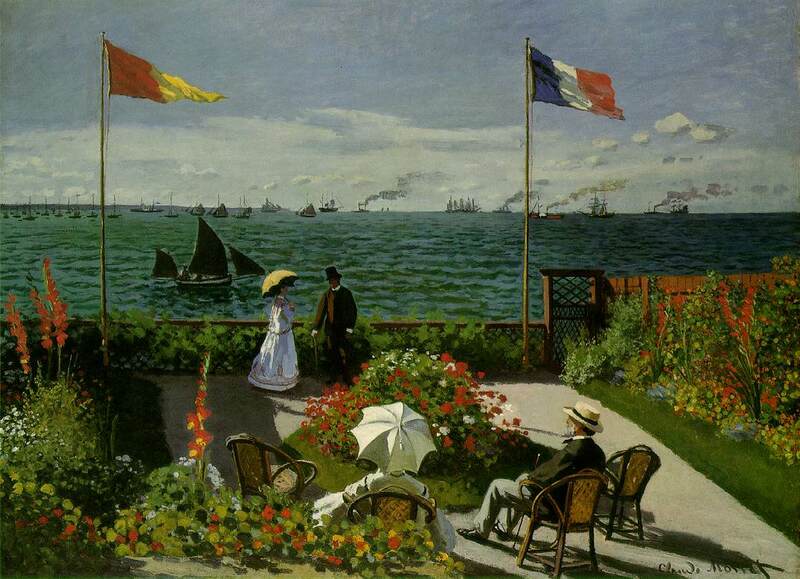 In this section, we provide as an example a set of RDF annotations of a painting by Claude Monet, which is in English known as "Garden at Sainte-Adresse". It is part of the collection of the Metropolitan Museum of Art in New York. The corresponding RDF file is available as a separate document. No special annotation tools were used to create the annotations. We assume that cultural heritage organizations that need to publish similar metadata will do so by exporting existing information from their collection database to RDF. Below, we discuss the different annotations used in this file. The file starts as a typical RDF/XML file, by defining the XML version and encoding and defining entities for the RDF and VRA namespaces that will be used later. Note that we use the RDF/OWL schema of VRA Core developed by Mark van Assem. VRA Core does not specify how works, images or annotation records should be identified. For the two images, we have chosen for the most straightforward solution and use the URI of the image as the identifying URI. We did not have, however, a similar URI that identifies the painting itself. We could not reuse the URI of one of the images. This is not only conceptually wrong, but would also lead to technical errors: it would make the existing instance of vra:Image also an instance of the vra:Work class, while this is not allowed by the schema. In the example, we have decided to 'mint' the URI of the painting by arbitrary selecting the URI of one of the images, and prefixing it by http://thing-described-by.org/?. This creates a new URI that is distinct from the image itself, but when the browser resolves it, it will be redirected to the image URI by the thing-described-by.org web server (one could argue if the use of an http-based URI is actually appropriate here. See What do HTTP URIs Identify? and [httpRange-14] for more details on this discussion). Warning: The annotations described below also contain a vra:idNumber.currentRepository element, that defines the identifier used locally in the museum's repositories. These local identifiers should not be confused with the globally unique identifier that is provided by the URI. The next line opens the RDF block, declares the namespaces using the XML entities defined above. Out of courtesy, it uses rdf:seeAlso to help agents find the VRA schema that is used. Many values are filled with RDF Literals, of which the value is not further constraint by the schema. But many of these values are actually terms from other controlled vocabularies, such as the Getty AAT, ULAN or a image type defined by MIME. Using controlled vocabularies solves many problems associated with free text annotations. For example, ULAN recommends a spelling when an artist's name is used for indexing, so for the vra:creator field we have exactly used this spelling ("Monet, Claude"). The ULAN identifiers of the records describing Claude Monet and the "artist" class are given in XML comments above. The use of controlled vocabulary can avoid confusion and the need for "smushing" different spellings for the same name later. This approach requires, however, that an unambiguous URI-based naming scheme is defined for all terms in the target vocabulary (and in this case, such a URI-based naming scheme does not yet exist for AAT terms). Additional Semantic Web-based processing is also only possible once these vocabularies become available in RDF or OWL. Many of the fields below do not contain information about the current situation of the painting, but information about places and collections the painting has been in the past. This provides provenance information that is important in this domain. Finally, we define the properties that are specific to the two images of the painting, which differ in resolution, copyright, etc. The first set of annotations describe a 500x300 pixel image that is located at the website of the Metropolitan itself, while the second set describes the properties of a larger resolution (1075 x 778px) image at Mark Harden's Artchive website. Note that VRA Core does not specify how Works and their associated Images should be related. In the example we follow Van Assem's suggestion and use vra.relation.depicts to explicitly link the Image to the Work it depicts. The example above reveals several technical issues that are still open. For example, the way the URI for the painting was minted is rather arbitrary. Preferably, there would have been a commonly accepted URI scheme for paintings (c.f. the LSID scheme used to identify concepts from the life sciences). At the time of writing, the VRA, AAT and ULAN vocabulary used have currently no commonly agreed upon RDF or OWL representation, which reduces the interoperability of the chosen approach. Tool support is another issue. While some major database vendors already start to support RDF, generating the type of RDF as shown here from existing collection databases will in many cases require non trivial custom conversion software. From a modeling point of view, subject matter annotations are always non-trivial. As stated above, it is hard to give general guidelines about what should be annotated and to what depth, as this can be very application dependent. Note that in this example, we annotated the persons that appear in the painting, and we modeled this information as properties of the painting URI, not of the two image URIs. But if we slightly modify our use case and assume one normal image and one X-ray image that reveals an older painting under this one, it might make more sense to model more specific subject matter annotations as properties of the specific images. Nevertheless, the example shows that a large part of issues described by the use case can be solved using current Semantic Web technology. It shows how RDF can be used together with existing vocabularies to annotate various aspects of paintings and the images that depict them. Drawing representing an offside position of a football player while his partner is scoring with his head during a game. Personal artwork, used with permission. The use case described in Section 1.3 is typically one that requires the use of multiple vocabularies. Let us imagine that the image to be described is about a refused goal of a given soccer player (e.g. 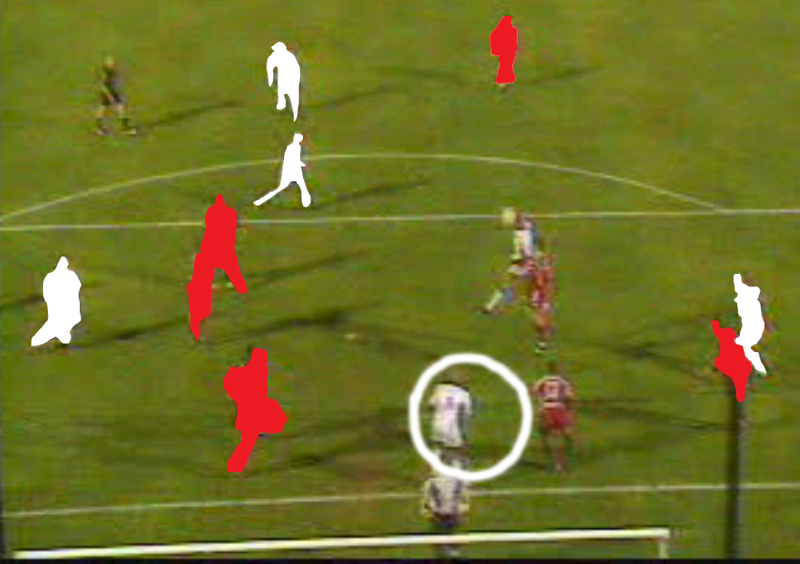 J.A Boumsong) for an active offside position during a particular game (e.g. Auxerre-Metz played on 2002/03/16). First, the image can be extracted from a weekly sports magazine broadcasted on a TV channel. This program may be fully described using the vocabulary developed by the [TV Anytime forum]. Second, this image shows the player Jean-Alain Boumsong scoring with his head during the game Auxerre-Metz. The context of this football game could be described using the [MPEG-7] vocabulary while the action itself might be described by a soccer (or football) ontology. Finally, a soccer fan may notice that this goal was actually refused for an active offside position of another player. On the image, a circle could highlight this player badly positioned. Again, the description could merge MPEG-7 vocabulary for delimiting the relevant image region and a domain specific ontology for describing the action itself. In the following, we provide as an example a set of RDF annotations illustrating these three levels of description as well as the vocabularies involved. Let us consider that the image comes from a weekly sports magazine named Stade 2 broadcasted on March, 17th 2002 on the French public channel France 2. This context can be represented using the TV Anytime vocabulary which allows for a TV (or radio) broadcaster to publish its program listings on the web or in an electronic program guide. Therefore, this vocabulary provides the necessary concepts and relations for cataloging the programs, giving their intended audience, format and genre, or some parental guidance. The vocabulary contains also the vocabulary for describing afterwards the real audience and the peak viewing times which are of crucial importance for the broadcasters in order to adapt their advertisement rates. Apollo 7 Saturn rocket launch - October, 10th 1968. Image courtesy of NASA, available at GRIN, used with permission. One possible solution for the requirements expressed in the use case description in Section 1.4 is an annotation environment that enables users to annotate information about images and/or their regions using concepts in ontologies (OWL and/or RDFS). More specifically, subject matter experts will be able to assert metadata elements about images and their specific content. Multimedia related ontologies can be used to localize and represent regions within particular images. These regions can then be related to the image via a depiction (or annotation) property. This functionality (to represent images, image regions, etc.) can be provided, for example, by the MINDSWAP digital-media ontology, in conjunction with FOAF (to assert image depictions). Additionally, in order to represent the low level image features of regions, the aceMedia Visual Descriptor Ontology can be used. As discussed above, this scenario requires the ability to state that images (and possibly their regions) depict certain things. 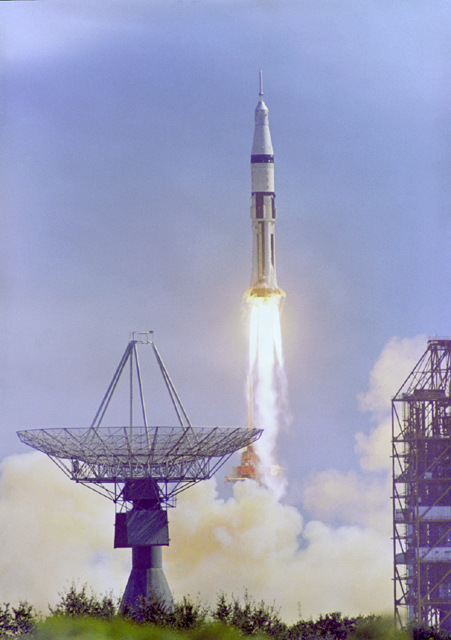 For example, consider a picture of the Apollo 7 Saturn rocket launch. One would want to make assertions that include that the image depicts the Apollo 7 launch, the Apollo 7 Saturn IB space vehicle is depicted in a rectangular region around the rocket, the image creator is NASA, etc. One possible way to accomplish this is to use a combination of various multimedia related ontologies, including FOAF and the MINDSWAP digital-media ontology. More specifically, image depictions can be asserted via a depiction property (a sub-property of foaf:depiction) defined in the MINDSWAP Digital Media ontology. Thus, images can be semantically linked to instances defined on the Web. Image regions can be defined via an ImagePart concept (also defined in the MINDSWAP Digital Media ontology). Additionally, regions can be given a bounding box by using a property named svgOutline, allowing localizing of image parts. Essentially SVG outlines (SVG XML literals) of the regions can be specified using this property. Using the Dublin Core and the EXIF Schema more general annotations about the image can be asserted including its creator, size, etc. A subset of these sample annotations are shown in the RDF graph below. Additionally, the entire annotations of the Apollo 7 launch are available in this RDF/XML file and reproduced below. In order to represent the low level features of images, the aceMedia Visual Descriptor Ontology can be used. This ontology contains representations of MPEG-7 visual descriptors and models Concepts and Properties that describe visual characteristics of objects. For example, the dominant color descriptor can be used to describe the number and value of dominant colors that are present in a region of interest and the percentage of pixels that each associated color value has. Existing toolkits, such as PhotoStuff and M-OntoMat-Annotizer, currently provide graphical environments to accomplish the annotation tasks mentioned above. Using such tools, users can load images, create regions around parts of the image, automatically extract low-level features of selected regions (via M-OntoMat-Annotizer), assert statements about the selected regions, etc. Additionally, the resulting annotations can be exported as RDF/XML (as shown above), thus allowing them be shared, indexed, and used by advanced annotation-based browsing (and searchable) environments. Microscopic image of lymph tissue. Image courtesy of prof. C.A. Beltrami, University of Udine, used with permission. A solution for the requirements expressed in the use case described in Section 1.5 includes support for annotating information about images and their regions. Given the numerous controlled vocabularies (including thesauri and ontologies such as ICD9, MeSH, SNOMED) that are already in use in the biomedical domain, the annotations should be able to make use of the concepts of these controlled vocabularies, and not be free text or keywords only. And given the many data stores that are already available (including electronic patient records), annotation should not be a fully manual process. Instead, metadata should be (semi)automatically linked to, or extracted from, these existing sources. For some medical imaging, image annotation is already done through image formats able to carry metadata, like DICOM for radiology. Preferably, Semantic Web-solutions should be made interoperable with such embedded metadata image formats. The ICD9-CM classification includes pathology and procedures concepts. SNOMED aims at the complete description of a clinical record. Eleven modules include terms for anatomy, diagnosis, morphological aspects, organisms, procedures and techniques, and more. MeSH is a terminology developed for describing scientific literature items. NCI Thesaurus, more recently developed, is a complete ontology devoted to concepts related to oncology. The National Library of Medicine also developed UMLS (Unified Medical Language System), including a meta-thesaurus where terms coming from over 60 biomedical terminologies in many languages are connected in a semantic network. The orginal formats of all these ontologies are not in RDF or OWL. However, they can be (or already have been) converted into these languages. All metadata described above is covered by one or more of these vocabularies. Furthermore, thanks to UMLS, it is also possible to move from one vocabulary to another using the meta-thesaurus as a bridge. As a sample, the gastric mucosa can be brought from MeSH, where it has unique ID D005753, and is placed in the digestive system subtree as a part of the stomach as well as in the tissue subtree among the membranes. Such kind of metadata may help in retrieving images with greater recall than usual. In fact, a student might search for images of the stomach. If annotated as suggested, the student will be able to discover this image of the gastric mucosa, since it is a part of the stomach according to the MeSH ontology. On the other side, when looking for samples of membranes, she will again find also this image, since it is also depicting a specific kind of membrane. The same could be said for queries involving epithelium, which is not the main subject of the image, but it is still a part of it. The subject has been described using terms from MeSH. Another level of description regards the biological sample and its preparation for microscopy. The biological sample comes from a body organ. It has been sectioned and stained using some specific chemical product. Associated to the sample, there are one or more diagnostic hypotheses, which derive from both patient data and image (or images) content. Let's consider to have a chromogranin stained section of a lymph node (chromogranin is an immunohistochemical antibody), showing signs of metastatis from a carcinoid tumor. A final level of description regards the acquisition device, constituted by a microscope with specific optical properties (the most important of which are objective magnification and numerical aperture, which influence the optical resolution and thus the visible detail), and the camera, with its pixel resolution and color capabilities. In this scenario, the image might have been acquired with a 10x objective, 0.20 NA, at a resolution of 1600x1200 pixel. In addition to global metadata referring to the whole image, multimedia related ontologies can be used to localize and represent regions within particular images. Annotations can provide for a description of specific morphological features, including a specification of the depicted anatomical details, presence and kind of abnormal cells, and generally speaking, features supporting the above mentioned diagnostic hypotheses. 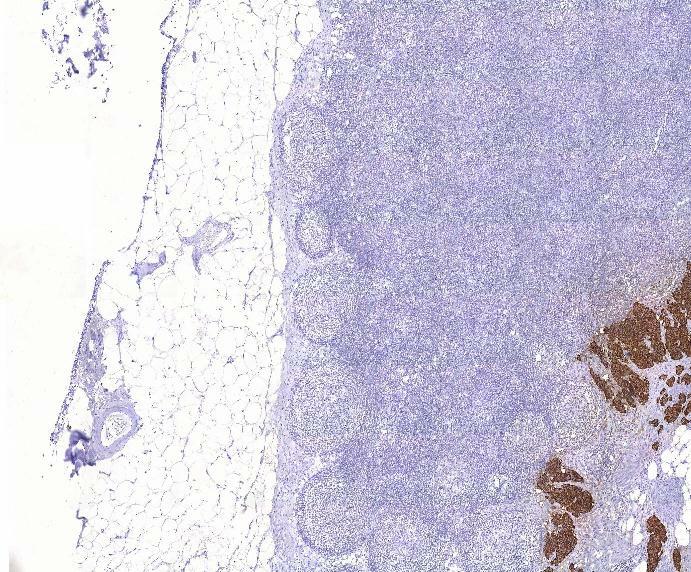 In such an image, metastatic cells are evidentiated in brown by the staining, and can be semantically annotated. In this case, the MeSH terminology does not provide sufficient detail, so that we must chose another source of terms: the NCI Thesaurus is one possibility. Current Semantic Web technologies are sufficiently generic to support annotation of a wide variety of Web resources, including image resources. This document provides examples of the use of Semantic Web languages and tools for image annotation, based on use cases for a wide variety of domains. It also briefly surveys some currently available vocabularies and tools that can be used to semantically annotate images so that machines can better process them. The use of Semantic Web technologies has significant advantages in applications areas in which the interoperability of heterogeneous metadata is important and in areas that require an explicitly defined and formal semantics of the metadata in order to perform reasoning tasks. Still, many things need to be improved. Commonly accepted, widely used vocabularies for image annotation are still missing. Having such vocabularies would help in sharing metadata across applications and across multiple domains. Especially, a standard means to address subregions within an image is still missing. In addition, tool support needs to improve dramatically before Semantic Web-based image annotation can be applied on an industrial scale: support needs to be integrated in the entire production and distribution chain. Finally, many existing approaches for image metadata are not based on Semantic Web technologies, and work is required to make these approaches interoperable with the Semantic Web. Thanks to Vincenzo Della Mea (University of Udine) for contributing the biomedical images use case. The editors would also like to thank Chris Catton (University of Oxford), Karl Dubost (W3C), John Smith (IBM T. J. Watson Research Center) and the following W3C Semantic Web Best Practices & Deployment Working Group and W3C Multimedia Semantics Incubator Group members for their feedback on earlier versions of this document: Georges Anadiotis, Patrizia Asirelli, Mark van Assem, Jeremy Caroll, Stamatia Dasiopoulou, Jane Hunter, Suzanne Little, Massimo Martinelli, Libby Miller, Ovidio Salvetti, Guus Schreiber and Michael Uschold. The following list described the changes made to this document since the previous public version (March 22, 2006). It also describes all responses of the editors to comments on the previous version. Feb 15. Troncy turned the document into an XG Report. Sept 4. Troncy revised the whole document for incubator group review. July 20. Troncy revised the various XML/RDF examples typos, see also the announcement on the list. June 15. Van Ossenbruggen added and edited the biomedical use case provided by Vincenzo Della Mea of the University of Udine. Also added Vincenzo to the Acknowledgments section. May 4. Van Ossenbruggen revised Semantic Web Basics section, see also the announcement on the list. May 4. Troncy substancially revised the Television Archive use case and its solution (section 5.3). See also the announcement. May 2. Response to Annotation Context mail by Karl Dubost: Van Ossenbruggen revised the text in the paragraph mentioned. Also added Karl to Acknowledgments. April 27. Response to Use cases mail by Karl Dubost: Van Ossenbruggen followed suggestions made by Karl. April 27. Response to Prose Improvement mail by Karl Dubost: Van Ossenbruggen changed prose of abstract, changed prose of interoperability section. April 11. Stamou and Tzouvaras revised section 5.1 Use Case: Management of Personal Digital Photo Collections . See also the announcement on the list. The broken links reported by Mike Uschold have been fixed. March 28. Response to Mathias Lux: Van Ossenbruggen decided not change this document because tools mentioned are not Semantic Web based, instead we added relevant pointers to Resources overview. March 28. Response to Vincenzo Della Mea : The editors have kindly invited Vincenzo to submit a use case before April 28.